Since the start in 1970 Putoline Oil is a leading player in the (international) lubricants market exclusively for the motorized two-wheel segment. Experience and specialized technical knowledge enables us to continuously focus on product innovation. In recent years, we have worked hard on the development of an all surpassing additive technology: N-TECH®. Part of the N-TECH® additive technology is a new API group 5 fully synthetic base oil. This superior base oil quality with new features has recently become a suitable motorcycle oil additive. By opting for a very accurate and optimal dose of the N-TECH® additive technology a product of superior quality has been created. NEW PRODUCT RANGE Lubricants contribute to a large extent to the durability of modern engines and transmissions. Ten years ago, Putoline Oil was the first to introduce Nano technology in its motorcycle lubricants. The brand now moves forward and proudly introduces NTECH®, the next step in additive technology for motorcycles and the worthy successor to the Nano-Tech range. 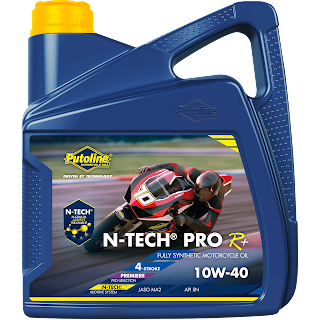 The top range of Putoline Oil is the N-TECH PRO R + which is available in various viscosities in both ROAD and OFF ROAD versions. It is developed and suitable for the most conceivable and diverse conditions from 'year round use' to 'extreme competition'. Next to this range, various other products in the range are also enriched with the new N-TECH® additive technology. In addition, a completely new racing product is expected later this year, developed to offer ultimate protection for motorcycles under racing conditions. This product will also be produced with the new N-TECH® additive technology. UPDATE LABEL DESIGN Simultaneously with the introduction of N-TECH®, Putoline Oil is introducing a completely new label design in line with the current corporate identity and market trends. In collaboration with a 3D render artist, various representative motorcycles have been created digitally in recent months. This new approach focuses on the motorcycles in the label designs, while the chosen models are neutral and typical of the application of the product. This state-of-the-art 3D visualization gives N-TECH® the ultimate look. 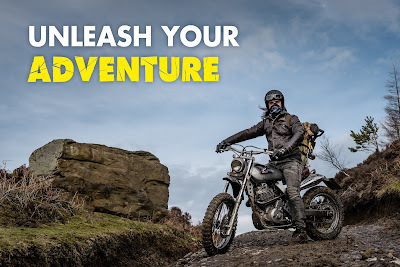 UNLEASH YOUR ADVENTURE In the coming months Putoline Oil will introduce the N-TECH® additive technology and its new label designs with a smashing campaign with the theme 'UNLEASH YOUR ADVENTURE'. The kick-off is a video campaign in which the adventure and the search for the exclusive N-TECH® additive is captured. With this new Putoline products everyone can start their adventure whether it is during daily use, in competition or extreme adventure! PUTOLINE OIL, DRIVEN BY TECHNOLOGY Putoline Oil is characterized by a high-quality, attractive and complete product range. Flexibility and fast reaction to market developments are of great importance. Through constant research and an innovative policy, the Putoline assortment is always of high quality and up-to-date.